This is not Texas style (no beans, small cubes of beef), and it’s certainly not Maryland style (ground beef, chunky veggies, with or without beans), this is Cincinnati style! A true Ohio original recipe. Cincinnati chili (or “Cincinnati-style chili”) is a regional style of Chili con carne characterized by the use of unusual seasonings such as cinnamon, cloves, allspice or chocolate. It is commonly served over spaghetti or as a hot dog sauce, and is normally of a thin, sauce-like consistency, unlike most chili con carne. Like any other regional dish, the exact origins or creators of Cincinnati chili are probably debatable. I do know that Skyline Chili (1949) is one of the oldest “chain” restaurants serving this dish. We are lucky to be able to purchase a box of frozen Skyline Chili from our local Harris-Teeter grocery store here in Maryland, and so that’s the brand we go with for now. And what could be easier to do? 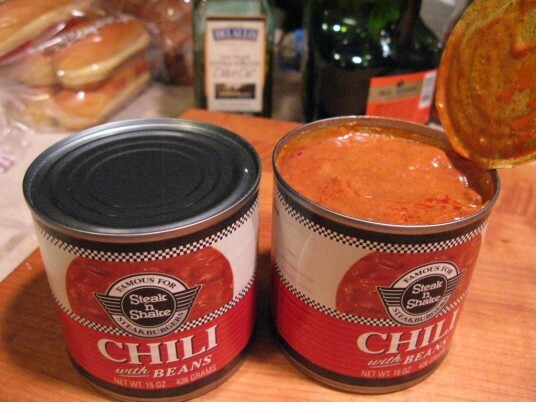 Heat up the chili in a pot, we add 1 can of dark kidney beans, (for 2 boxes of Skyline chili, we also add 1 can of light red kidney beans) to the mix. Cook up a big pot of your favorite pasta, we like thin spagetti, shred some cheddar cheese, dice up some onions, and there’s a meal! It’s so delicious. 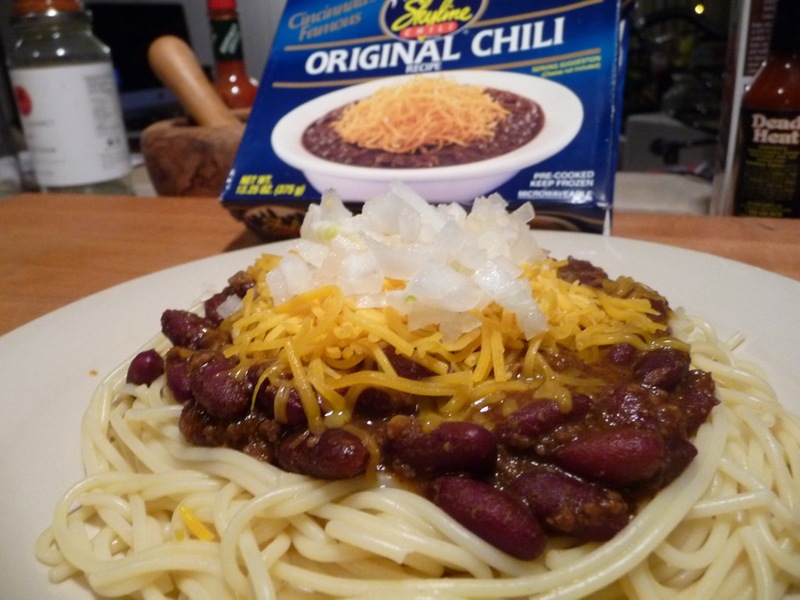 Most of the folks I work with have never heard of Cincinnati Style Chili, and so I happily share with them what I think is just a great, American made meal. 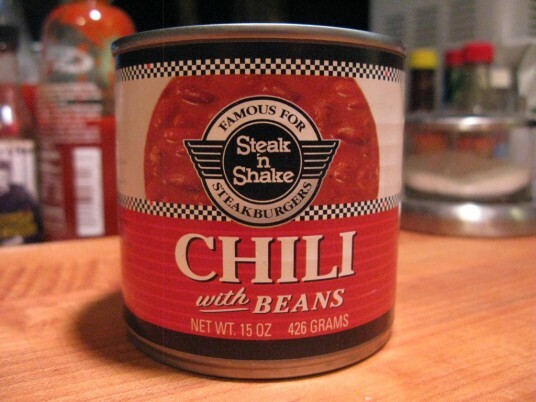 Our Cincinnati Style Chili with Steak n Shake’s recipe… note the dark sauce around the edge of the dish. This was an amazingly simple recipe, that for me made the dish unique. Marilyn was not as impressed, but I loved the simplicity of it. Ketchup and worchestershire sauce. Actual recipe for the extra sauce, from the can’s label: 4 parts ketchup with 1 part Worchestershire sauce. Yum! Last year when we *could* get to Cincinnati, we dined at Steak ‘n Shake, which turns out has their own awesome Cincinnati Chili recipe. 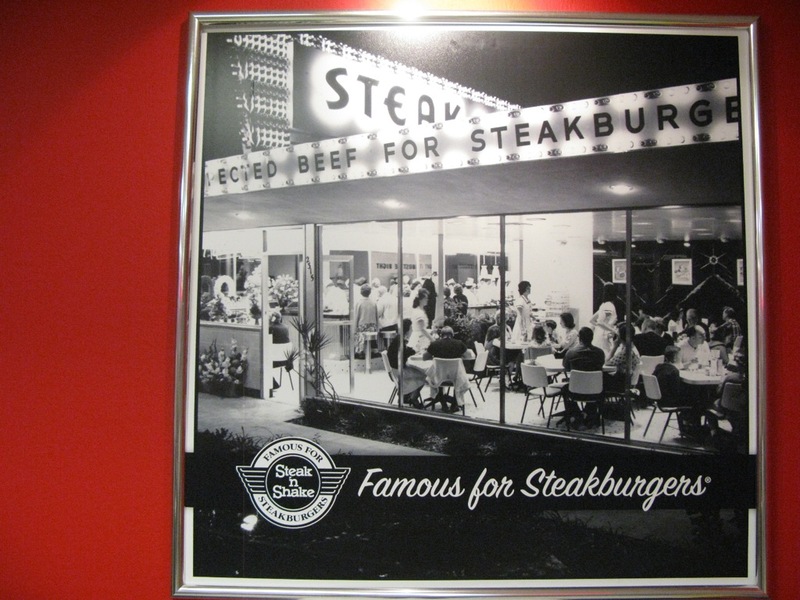 While we were there, we ordered their famous “steakburgers” and a Chicago dog… we didn’t know they were also known for their chili at that time. We have since had a few cans of Steak ‘n Shake Chili, and it was just as good as Skyline, from what I remember. These pics are from last year. As usual, click on any pic for a larger version. What's up with that uniform? My eyes! I love good chili my personal version starts with bacon then goes to sausage and then beef (ground or cubed it matters not) then three kinds of beans (black, kidney, great northern) diced tomatoes, tomato sauce, and lots of special spices. My family requests it at least once a month up to 4 in the winter. Thanks for the comment Paul. You certainly described a nice roundup of a good home-made chili. But have you ever fixed up a plate of Cincinnati style for you and yours? It’s certainly a different way to eat chili. Hey Brian and Marilyn! First saw Skyline Chili on the Food Network! Would love to get there someday. 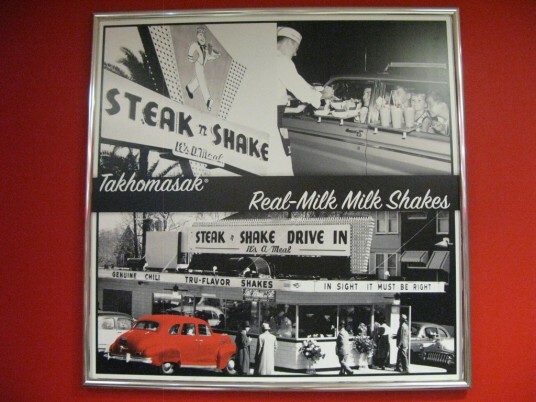 I do head to Steak n Shake from time to time, though! Then you are a lucky man my friend! We just loved it. The history, the old photos, it’s all good. Unfortunately, out here on the East Coast, we don’t have that many “old school” joints… Maybe we can count “Geno’s” as our own. They are making a comeback. 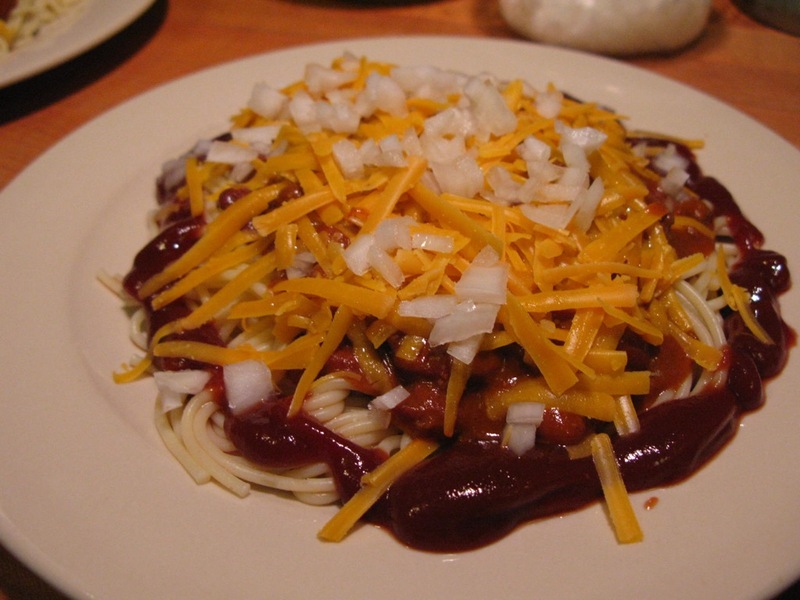 I’ve heard about Cincinnati chili but I haven’t experienced yet. I think I’d take mine 5 way though. Chris, Apparently there is even a 6 Way from the Dixie chain, that includes garlic. I will be adding that to our next plate of Cincinnati Chili for sure. But I would love to get the details from Dixie. More research! 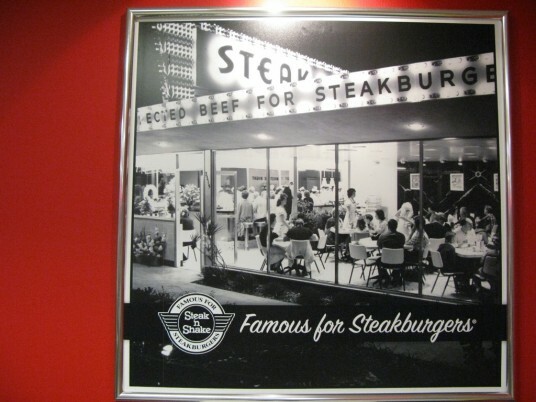 I used to love to get the 5-way at Steak and Shake, but we don’t live near one anymore. 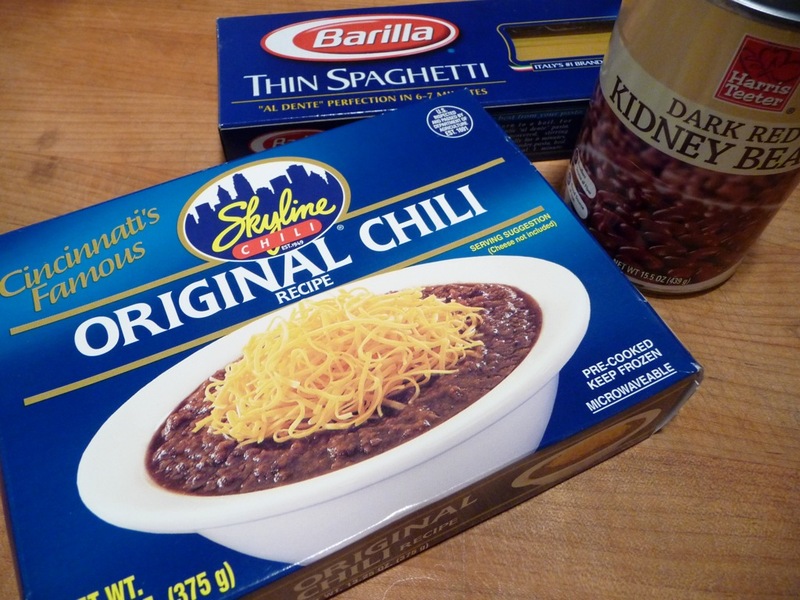 I’d love to find a box of that frozen Skyline chili in my store! Hi Julie, we found ours at Harris Teeter, but I don’t think they have those stores in Arizona 🙁 . BTW, love your blog! Hot and sour soup and the cherry pie? Great combination! Glad to see Skyline in other states. I’m lucky enough to live in Cincinnati. 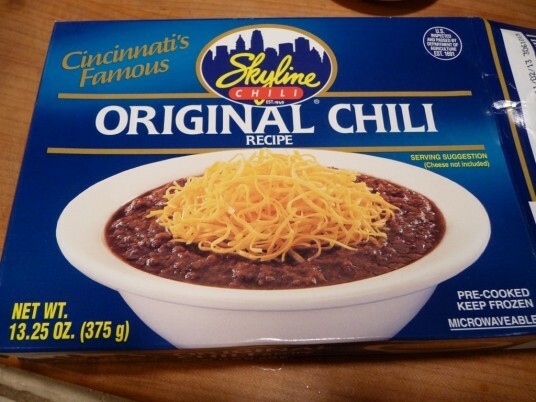 There are quite a few chili places here but Skyline is definitely the favorite. Gold Star Chili comes in as a close second. 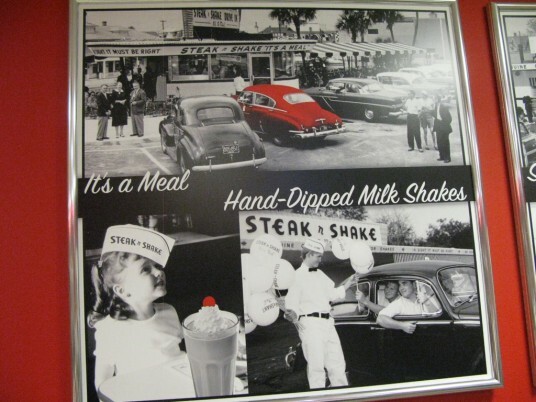 I guess I’ll have to try out Steak n Shake’s chili, I’ve never had it. Even though it’s frozen, we really like it! Please let us know what you think about Steak n Shake’s version… would love to hear your opinion, being a Cincinnati local. Never heard of Cincinnati Style Chilli before – I like the 5 elements you incorporate in this meal though, can’t go wrong. @ninja – Yea, it’s pretty much an Ohio thing, that’s for sure. But it does rock as a great dinner choice, and so very easy to put together. Thanks, yes I see that it would be easy. I love being introduced to awesome regional food and meals that exist around the world! Hey Brian! I’ve never had Skyline chili, but grew up in St. Louis with Steak ‘n Shake as a family favorite. I’ve been looking to recreate the recipe at home and everything falls WAY short. I recently ran across a Skyline version and thought the ingredients seemed similar. 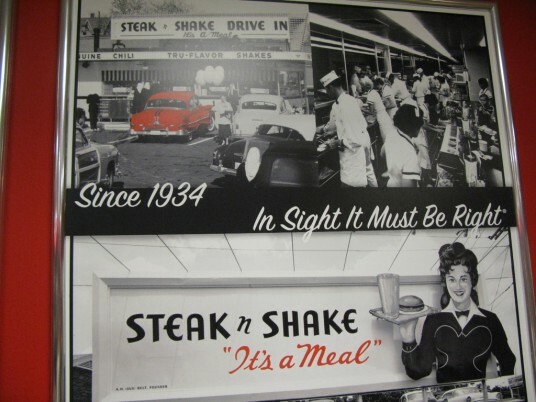 Would you say Skyline and Steak ‘n Shake have a similar taste?? If not, (or even if so,) what would you say is a major difference? (I.E.. I’ve heard skyline is sweeter. Thanks for any helpful advice! 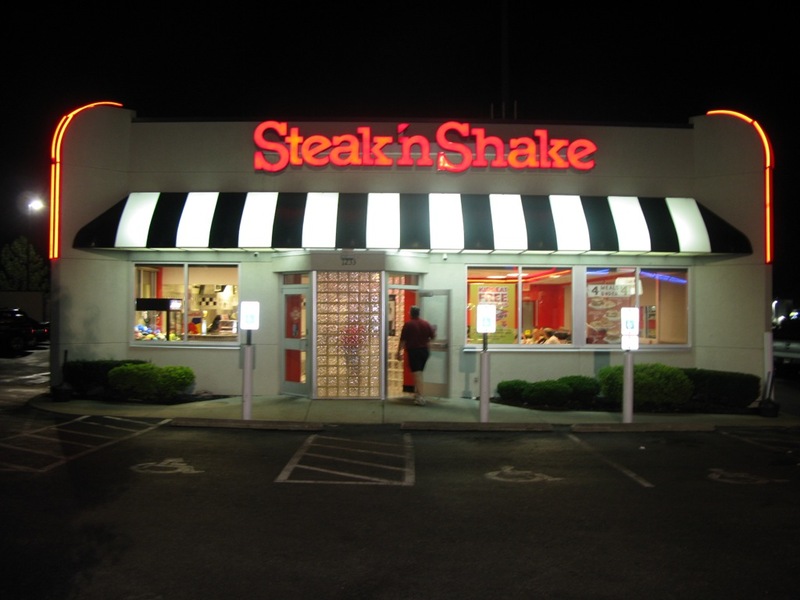 Angi – living in Maryland, we are nowhere near either restaurant. I only had the Steak n Shake once. We buy the Skyline as a frozen item from Harris Teeter grocery store. So, I’m not able to compare the two versions for you. Hopefully you can find Skyline at a grocery store near you. Where are you located now?